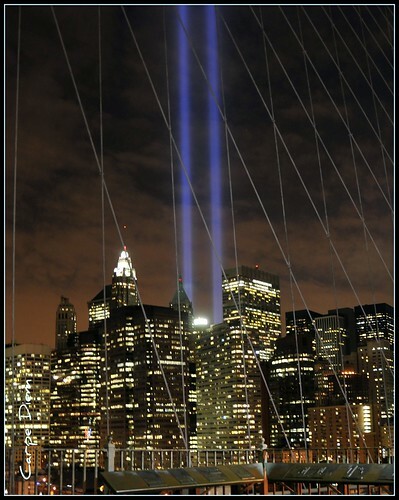 With the 10th anniversary of 9/11/01 approaching, there will be a bunch of events to commemorate and discuss. Two events are happening tonight. Double Feature: "Manhattan" & "Annie Hall"
5:30pm, 9:30pm -- "Annie Hall"
If you're going to see only a few Woody Allen movies, these two most often top the list when discussing his best work. Over the next week, there are more double features that are worthwhile. You could rent them, but this screen is probably bigger. And your living room doesn't offer balcony seating. Rememer the warnings of the Rapture a couple months ago? The novel takes place in a world where something like that has happened. "Historical Context & Demos Illustrating the Relationship of Food and Science"
This isn't the most interesting of the Science & Cooking weekly lectures, but it is the first one. Consider yourself notified in case I don't list it every time. Of tonight's speakers, I've heard of Harold McGee who has written some amazing pieces on the scientific approach to good cooking. The other guys are no slouches either. Over the years, I've picked up occasional issues of Granta and have felt more erudite for it. The current anthology of essays, stories, poems, etc is inspired by the 9/11 attacks in various ways that was edited by journalist Anthony Shadid (was held by Libyan forces earlier this year). Robin Young of NPR's "Here & Now" joins the conversation and will likely do her host thing.